This is a photo from the Italy Pavilion at EPCOT Center in Walt Disney World. 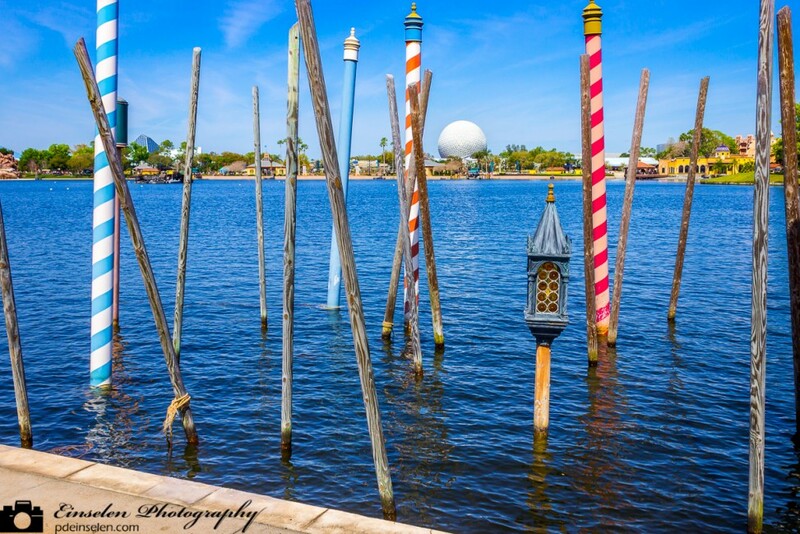 This photo showcases Spaceship Earth in the background of the poles the gondola are tied to. Shot across the World Showcase Lagoon the blue sky and water compliment each other. The Italy Pavilion features a plaza surrounded by a collection of buildings evocative of Venetian, Florentine, and Roman architecture. Venetian architecture is represented by a re-creation of St Mark’s Campanile (bell tower) and a replica of the Doge’s Palace. The pavilion’s design is inspired by other hallmarks of Italian architecture, such as the Neptune Fountain (reminiscent of Rome’s Trevi Fountain) and the Il Bel Cristallo shop (meant to resemble the exterior of the Sistine Chapel). Musicians, clowns, and acting troupes often appear in the piazza throughout the day. There are also small shops selling Italian goods, such as candy and wine. The original plans for the pavilion called for an expansion that would be built in Epcot’s “Phase II” of construction, thus leaving a wall with nothing behind it at the rear of the pavilion. The expansion would have included a gondola dark ride and a Roman ruins walk-through. When “Phase II” was canceled, the pavilion was left incomplete. However, a restaurant by the name ofVia Napoli, designed by the Florentine architects Stefano Nardini and Raffaella Melucci, opened under the Patina Restaurant Group in 2010, and brought the pavilion its long-awaited completion. It features Florentine architecture and authentic Neapolitan cuisine. The water used to make pizza dough is imported from Pennsylvania to simulate authentic Neapolitan dough. Via Napoli’s three wood burning ovens pay tribute to the three active volcanoes in Italy: Etna, Vesuvio, and Stromboli. To do this, each of the three ovens are sculpted in the shape of the face of the god that their corresponding volcano is named after. The long communal table in the center of the room was built in Florence and features hand painted tiles depicting iconic monuments in Italy. Other notable features of Via Napoli are its high and vaulted ceilings, imported ceramics, and blown glass, and the abundance of windows that flood the establishment with natural light.